for $750,000 with 4 bedrooms and 3 full baths. 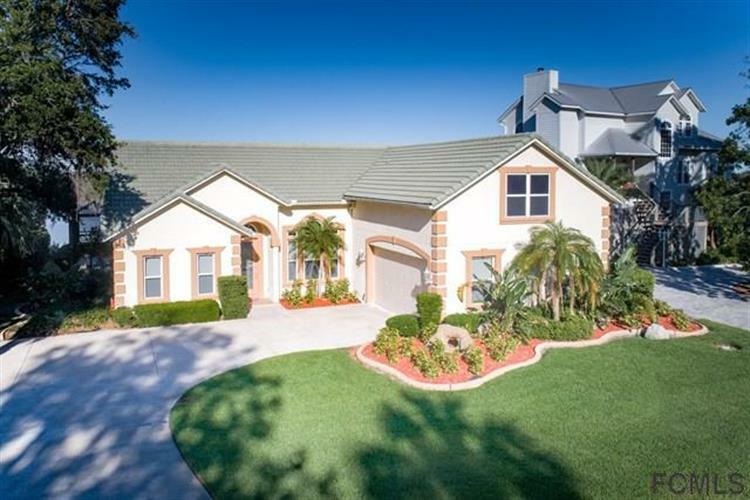 This 2,594 square foot home was built in 2003 on a lot size of 0.427 Acre(s). Spectacular Flagler Beach Intracoastal Waterway Custom Pool Home. Enjoy the best of both worlds...living on the beautiful Intracoastal waterway and only minutes from Flagler Beach. Home features include...1.5 stories, split plan, 2594 LSF, 4 bedrooms, 3 full bathrooms, oversized 2 car garage, mud room, formal dining room, great room, family room, chefs kitchen w/granite counter tops and island, custom 42" kitchen cabinets, beautiful water views from most rooms, Security system, central vacuum, gas fireplace, trey ceilings, professionally landscaped, sprinkler system on private well, saltwater pool w/screened lanai, boathouse w/lift and a separate jet ski lift, fishing dock w/built in seating for the whole family. You have to see this house to believe it and NO HOA FEE's!!! It's a boater and fisherman's dream home in sunny Flagler Beach, FL.